Canadian-made front and tail vises are innovative products. 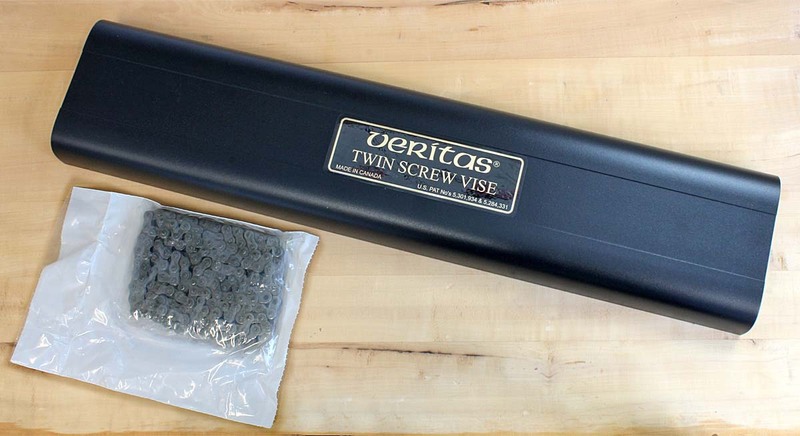 These vices made by Veritas in Ottawa are worth the high price due to unbeaten fine workmanship and detailed installation instructions. 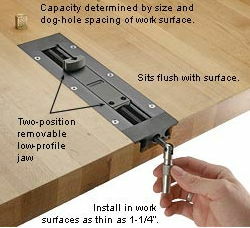 A 38 mm (1-1/2 inch) bit is needed to drill four holes. Assembled Vise shown! Wooden Jaws not included! For anyone requiring wider jaw capacity, this long cover accommodates vise screw centers up to 600 mm (24 inch), with sufficient chain to match. 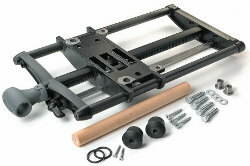 Using the same quick-release mechanism as the Veritas tail vise, this front vise has a simple on-off cam lever to engage or disengage the Acme-threaded screw. The body is ductile iron with zinc-alloy endplates, steel shafts and guide rods, and a maple handle. 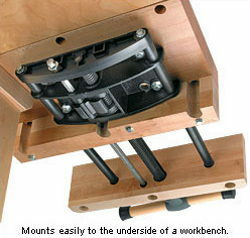 Mounting instructions and hardware included. 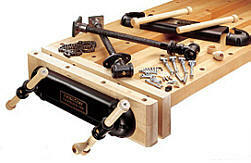 This front vise mounts easily to the underside of a workbench. Note: This vise comes with Square-Plus bits #2 and #3 which are not very common in most European countries. 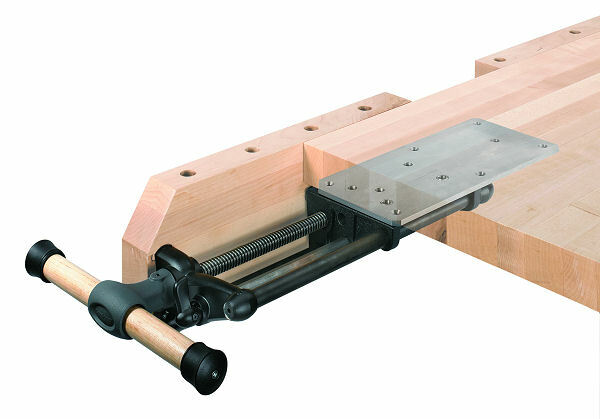 If you do not want to exchange the screws delivered with this vise we recommend to order the matching Square-Plus bits here. 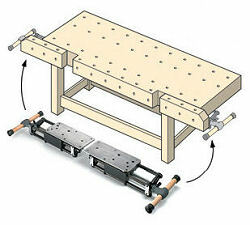 This low-profile vise is similar to a wagon vise in function, but in a compact, self-contained form for easy installation in a work surface, adding a permanent, adjustable dog right where it’s needed. 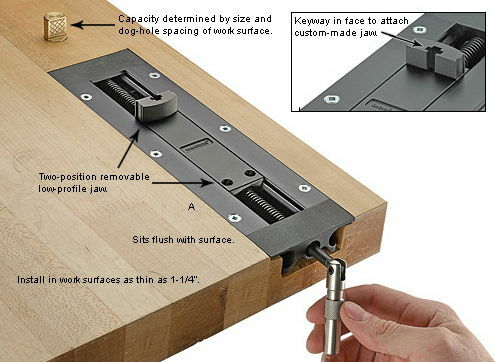 Designed to hold work between its single jaw and an external stop such as a bench dog, it has a clamping capacity that is limited only by the size and dog-hole spacing of your work surface. The knurled stainless-steel toggle handle turns a 1/2 inch (12.7 mm) diameter Acme-threaded steel rod to move the jaw in a 4 inch (100 mm) range of travel. The 1/2 inch (12.7 mm) tall, 13/16 inch (20 mm) wide jaw has two jaw-mounting positions spaced 3-7/8 inch (86 mm) apart, for compatibility with dog-hole spacing up to 7-3/4 inch (197 mm). 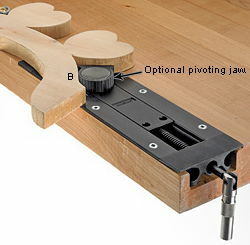 A keyway in the jaw face accepts a #10 nut for affixing custom shop-built jaws. 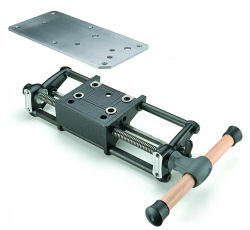 When the vise is not in use, the jaw can be removed whenever you need an unobstructed work surface. 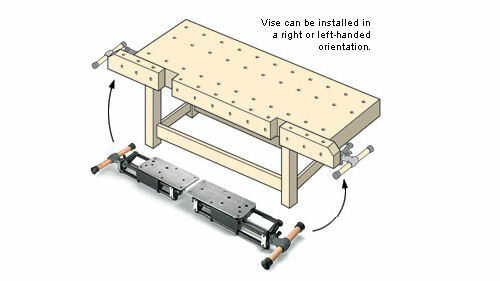 The vise installs flush in a stepped mortise in any surface at least 1-1/4 inch (32 mm) thick (instructions, template and mounting hardware provided). Constructed of machined steel castings and anodized aluminum extrusions. Available separately, this optional 1/2 inch (12.7 mm) tall, 1-1/2 inch (38 mm) wide pivoting jaw can also be used in place of the fixed jaw to clamp irregular objects against work stops positioned outside of the clamping axis.